Pile driving, wood pile foundations, Cape Cod house lifting, Provincetown house lifting, Cape Cod building, Cape Cod construction, Cape Cod heavy structural. 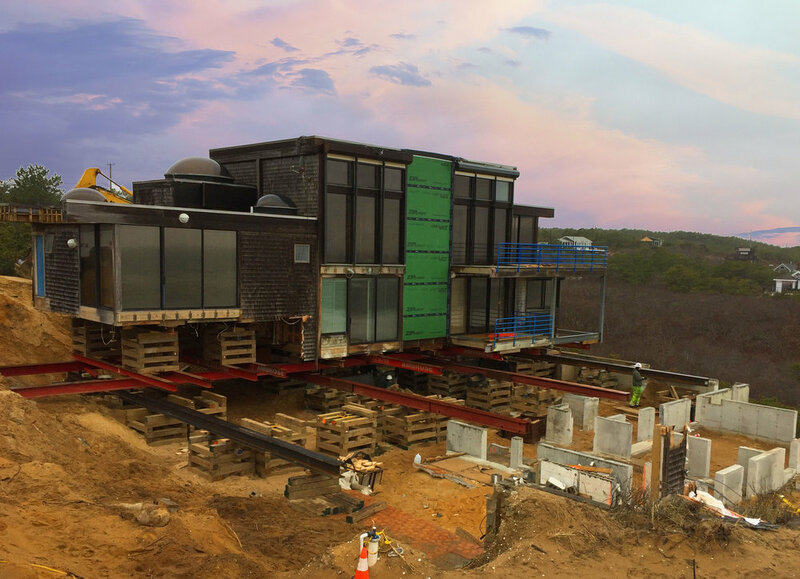 Ambrose homes, Inc. lifts buildings using a unified jacking system, installs Chase helical piers, drives sheet pilings, builds helical pier foundations, specialty foundations, performs shoring of buildings, installs structural steel, builds seawalls and bulkheads on Cape Cod. Cape Cod FEMA A-zone foundations, FEMA V-zone foundations, pile driving, structural welding, helical pier jacking. Ambrose Homes specializes in lifting and moving homes to save them from falling into the ocean due to increased erosion. We also install piers and speciality foundations. Ambrose Homes does all of this heavy structural work in house with our own crews and equipment. We own unified jacking systems which can lift one million pounds. These sophisticated systems make can be complicated and dangerous projects efficient and safe. We replace old, crumbling or rotting pilings and bases with brand-new full foundations that we build or, in many coastal applications, with FEMA A-zone and V-zone foundations, or helical piers, which we encase in concrete columns to raise the building out of harm’s way and allow the passage of flood waters without damaging the structure. On Cape Cod, the need for reliable bulkheads and seawalls has increased due to quickly-eroding shorelines. Ambrose Homes, Inc. repairs and installs bulkheads and seawalls using our specialized equipment and skilled crew to protect homes swiftly with low environmental impact. Bulkheads and seawalls are vertical shoreline stabilization structures that provide protection from waves and retain soil. Bulkheads and seawalls can be constructed from a variety of materials including concrete, wood, and vinyl. Seawalls are typically used to prevent homes from storm surges with pounding surf, eroding shorelines and waves. Constructs advanced concrete work using our own forms and specialty wood pile foundations. Are certified installers of Chance Helical Piers which are installed with our specialized drilling systems. Builds and renovates small bridges. Does speciality welding for custom heavy structural and custom staircases.